floorplansUsketch work with a wide variety of clients; ranging from private individuals placing a single, one off floor plan order right through to national chains of estate agents and property marketing companies that order hundreds of floor plans each month. To keep prices competitive and to benefit from time zone differences, we have based the production office and some of our management team in Sri Lanka. However, to give our clients the reassurance of a local contact we also have a team based in the UK and during normal UK working hours you can call our helpline to get technical advice and answers to any queries you might have. 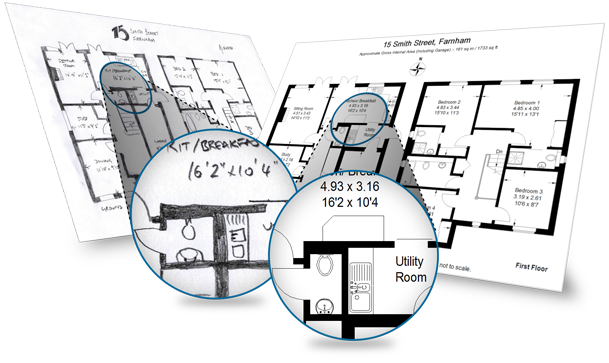 Experience tells us that producing quality, accurate floor plans and enhancing property photographs is sometimes not always as straightforward as it may seem at first and this is why we feel it is so important to have a UK based helpline that clients can contact us on. By choosing floorplansUsketch you are choosing to partner yourself with experts; Owen Turgoose, our Managing Director, has over 10 years' experience providing quality RICS compliant floor plans to the UK property industry. We have used his experience to design the floorplansUsketch online application, an extremely efficient automated system for processing and monitoring each job quickly and efficiently. For a summary of the site's key features and a list of the services we are able to offer please click on the services and demo link from the "Learn more" menu at the top of the page. You might think that all of this quality and accuracy would mean that we can only offer a very slow service but that is not the case; we have a next working day turnaround guarantee. Put us to the test and give us a try today - you won't regret it!